For the average C@W reader I can't recommend The Death of Stalin too highly. It's Armando Iannucci, so the pedigree is first class, you know it'll be tremendous. It's beautifully executed (if I may use that word in this context). 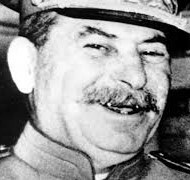 It isn't even played for laughs, really - excepting possibly Paul Whitehouse's Mikoyan and Rupert Friend's Vasily Stalin - although of course (coarse) humour is a primary vehicle for delivering the message. But crisp drama is another, & plenty of it, with multiple great performances. One of my party was a younger family member, supposedly well-educated, who asked afterwards - was any of that true? Hmmm. There really is no widespread knowedge of 20th century history, a state of affairs that will come to haunt us in the next few years. Anyhow - go see for yourselves. A young woman at work asked "Who was Queen Victoria ? What did she do ?" Younger family member, eh? This intergenerational fraternizing, I don’t know. There was a TV version of the story some years back, filmed in the old GLC headquarters. The Soviet ambassador (as was) was not amused and said so. Chamberlain was attacked by Foot as one of the guilty men. This from a man in thrall to Stalin. The left always lies, and luckily for us they have such terrible memories they forget the lies that they have told so that they become apparentl if you look. The fact that they have succeeded in producing an educational system that precludes looking is their greatest triumph. I have retired and drink like a fish, it is better than dealing with reality.